The red brick slum trips down the hillsides of eastern Caracas, and stumbles to a halt at a highway that separates the poor from the rest of Venezuela’s capital. Halfway down, in a makeshift church, about 30 children sit with their noses to the edge of wooden tables. Their eyes are fixed hard on plastic bowls, spoons gripped in tiny fists. The half-filled bowls of rice and beans are likely the only meal they’ll get that day. This is a feeding center in Petare, a community where 750,000 Venezuelans live in abject poverty. It is operated by local charity Alimentare la Solidaridad Petare, part of a network that runs 65 other feeding centers in 10 states across Venezuela. 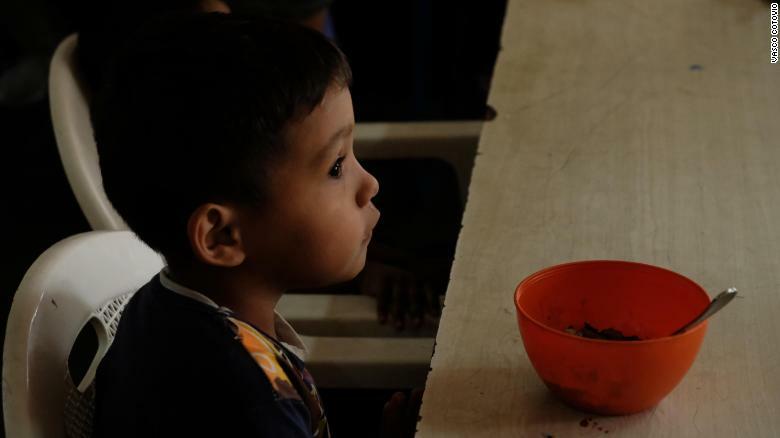 Imael, 5, with a bowl of rice and beans, his only meal of the day. Venezuela boasts the world’s largest-known oil reserves. But its people are going hungry, putting pressure on a demographic that was once fiercely loyal to the Chavez and then Maduro regimes. “We need medicine, we need food because they broke the system,” says Angel Alvarrez, the National Assembly representative for the Petare area, referring to embattled President Nicolas Maduro’s regime. Three million people have fled Venezuela in the last three years, according to the UN. Now, humanitarian aid is being mustered at Venezuela’s border at the call of Maduro’s rival Juan Guaido, the self-declared president who has won the recognition of many South American and European countries. His gambit will test Maduro’s relationship with the military, forcing soldiers at the border to choose between food and loyalty to him. 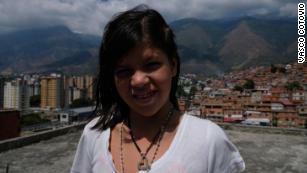 Rosbelis, 12, wants to escape the hunger and violence of Petare and become a photographer. Meanwhile, the US is working to beggar his administration, cutting off payments for Venezuelan oil and applying sanctions to Maduro’s inner circle. Without cash in hand, the Maduro regime could lose the loyalty of its enforcers, the Venezuelan military and police. Slums like Petare are where the battle for the political future of Venezuela is being fought. Under duress from hunger, anti-government protests have raged in some of the poorest parts of Caracas — and been met with swift police action. 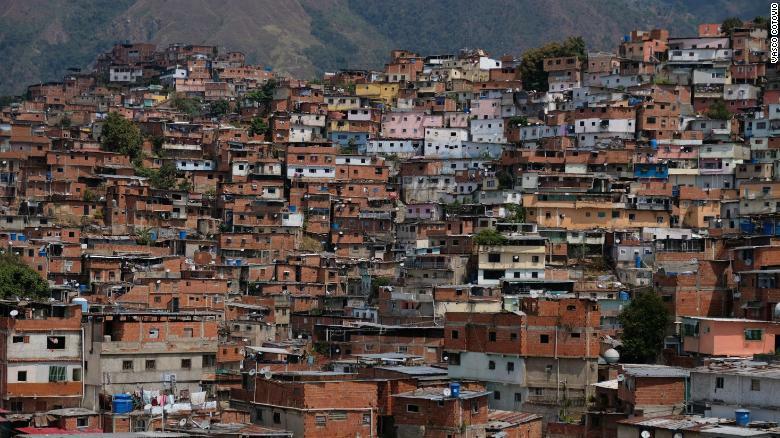 The government insists that its operations in Caracas’ slum areas are directed against gangs. Venezuela has one of the highest murder rates in the world. But Marvelys Paredes, 31, says Venezuelan police killed her cousin, Johny Gudoy, in retribution for protesting against the Maduro regime. Home to more than 700,000 people, the Petare barrio is the largest slum in South America. Gudoy was killed on January 25, two days after participating in huge demonstrations in support of Guaido. The 29-year-old had been filmed by friends dancing and shouting in an empty street outside his home on the way to the demonstrations. He had also been active in recruiting others from the city’s western slums to join the opposition, his cousin says. Two days later, he was at home while members of the police special forces searched for him outside, says Paredes. They were using images of Gudoy that had circulated on social media. Gudoy emerged from his home with his hands up, says Paredes, and was shot in the foot. He was then marched up the road a little and shot again, this time in the stomach. She says she could hear him begging for his life, asking to be spared to meet his unborn daughter, due next month. “A neighbor said he saw the police shove a rag in his mouth and suffocate him,” says Paredes. She claims her cousin died from the suffocation. Guaido visited the bereaved family last week. But not in Petare, because Gudoy’s mother is now in hiding. The Maduro government has made no comment on the case.